Tax Department (Foreign Trade) April 19th, 2012. 3 BACKGROUNDS Customs Law Reform, addition of the articles14-D, 135-A, 135-B, 135-C and 135-D, published in the Official Gazette of the Federation on December 30th, in force on July, 2003. On October 9th, 2003, was published on the Official Gazette the FOURTH Amendment Resolution Rules of General Character in the matter of foreign trade for 2003, through which was added the Chapter 3.9 “Strategic Bonded Warehouse”. 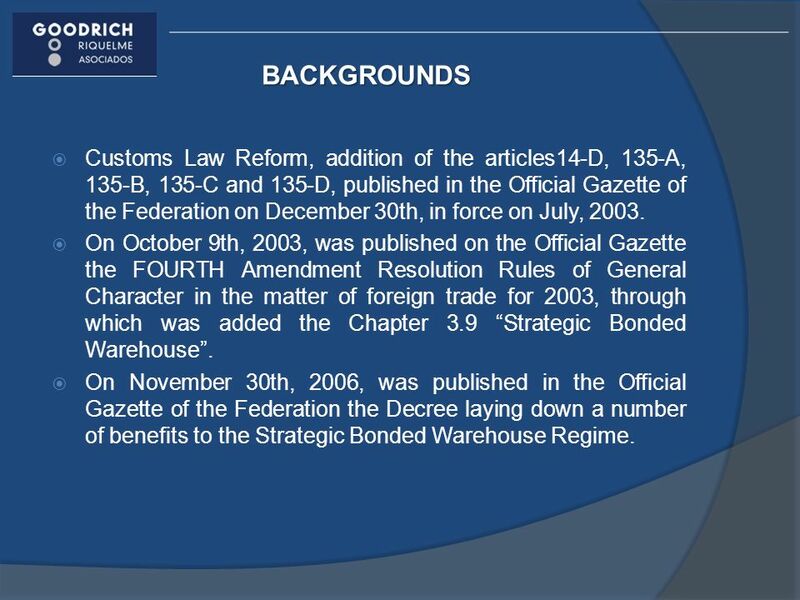 On November 30th, 2006, was published in the Official Gazette of the Federation the Decree laying down a number of benefits to the Strategic Bonded Warehouse Regime. 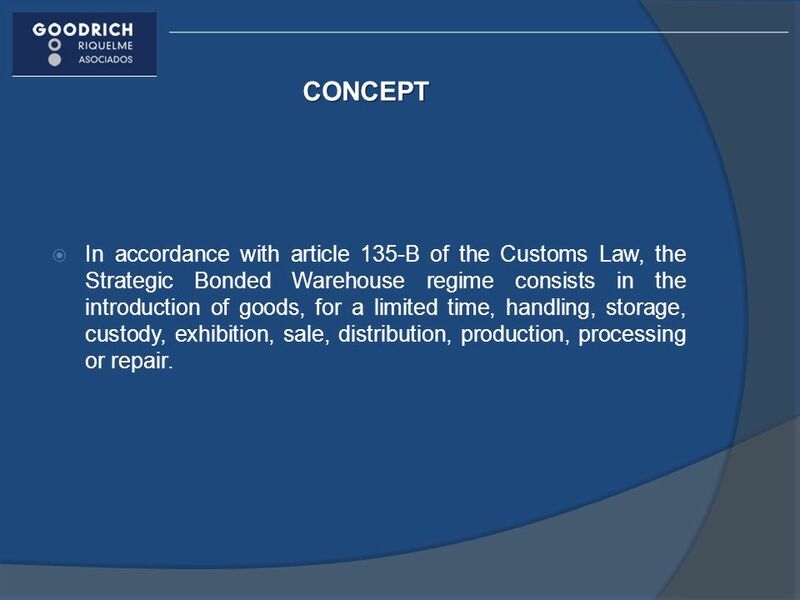 4 CONCEPT In accordance with article 135-B of the Customs Law, the Strategic Bonded Warehouse regime consists in the introduction of goods, for a limited time, handling, storage, custody, exhibition, sale, distribution, production, processing or repair. 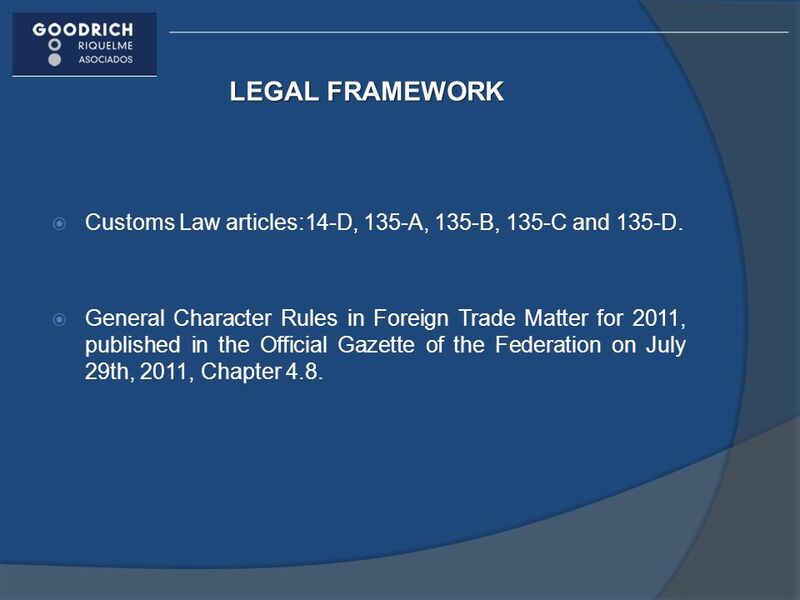 5 LEGAL FRAMEWORK Customs Law articles:14-D, 135-A, 135-B, 135-C and 135-D. General Character Rules in Foreign Trade Matter for 2011, published in the Official Gazette of the Federation on July 29th, 2011, Chapter 4.8. 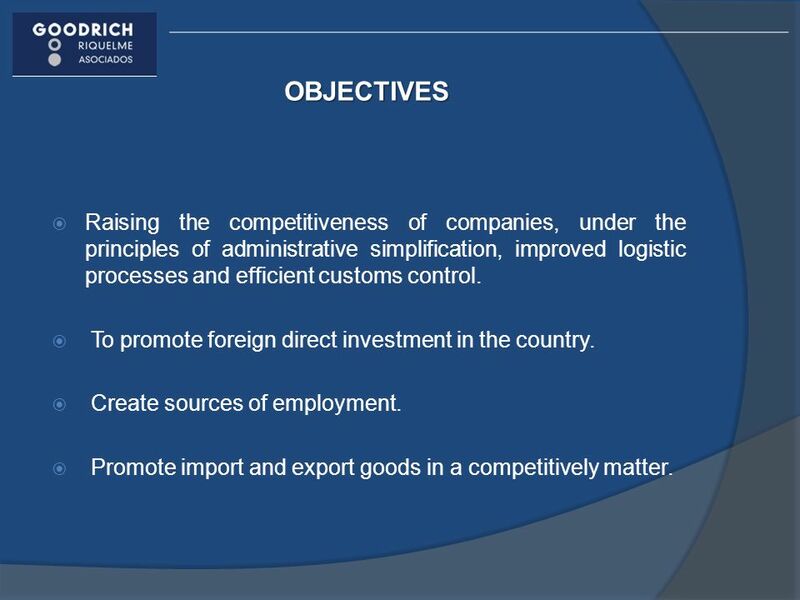 6 OBJECTIVES Raising the competitiveness of companies, under the principles of administrative simplification, improved logistic processes and efficient customs control. To promote foreign direct investment in the country. Create sources of employment. Promote import and export goods in a competitively matter. 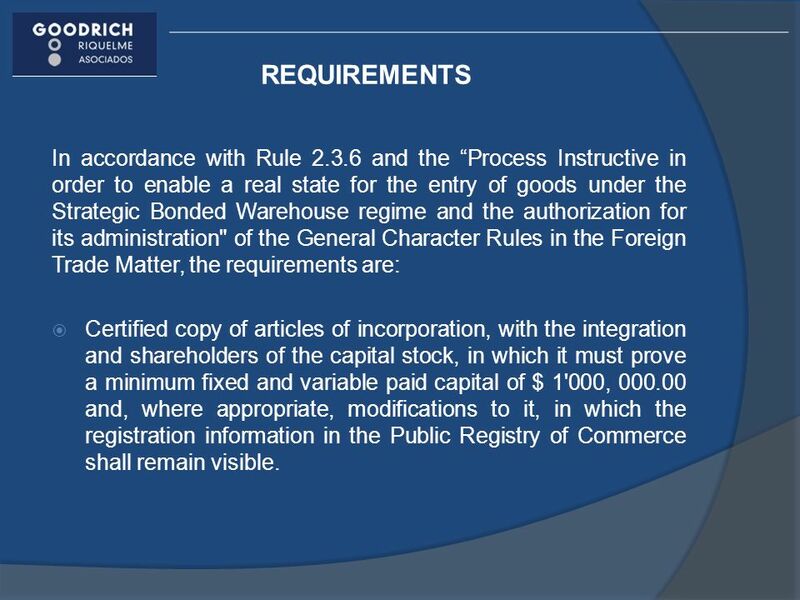 7 REQUIREMENTS In accordance with Rule and the “Process Instructive in order to enable a real state for the entry of goods under the Strategic Bonded Warehouse regime and the authorization for its administration" of the General Character Rules in the Foreign Trade Matter, the requirements are: Certified copy of articles of incorporation, with the integration and shareholders of the capital stock, in which it must prove a minimum fixed and variable paid capital of $ 1'000, and, where appropriate, modifications to it, in which the registration information in the Public Registry of Commerce shall remain visible. 9 REQUIREMENTS a) Delimit the Strategic Bonded Warehouse in accordance to the guidelines that for that matter are issued by the ACPA. (Central Administration of Customs Planning.) 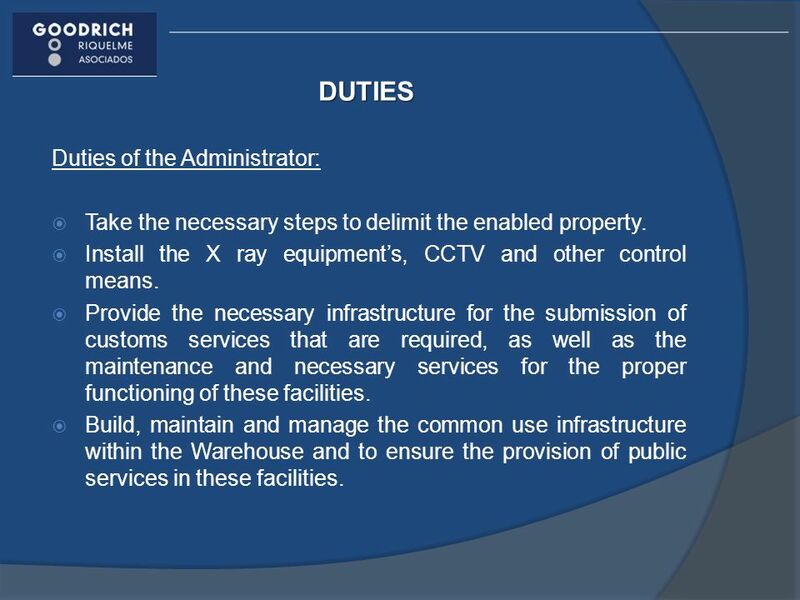 b) The installation of X ray equipment, CCTV, and other means of control, according to the guidelines that for that matter are issued by the ACPA The plans in which the area seek to enable as a Strategic Bonded Warehouse, is identified, according to the guidelines that for that matter are issue by the ACPA. 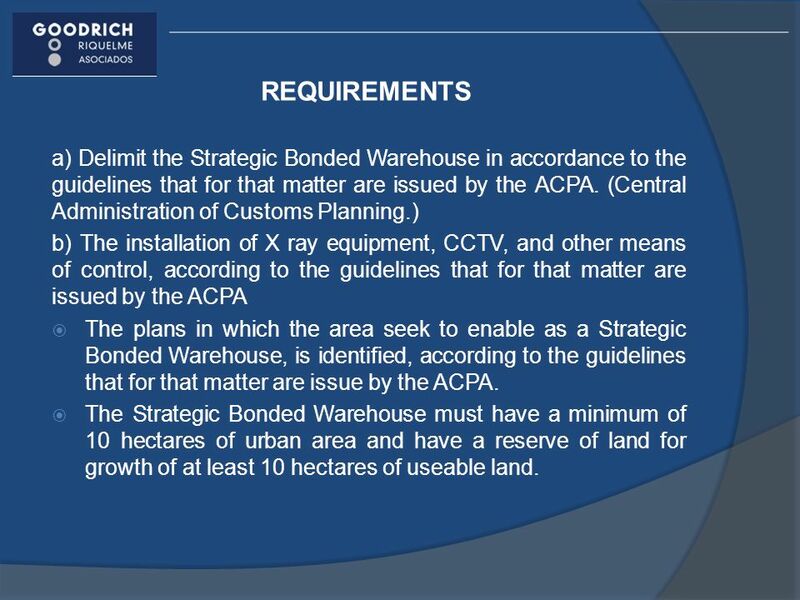 The Strategic Bonded Warehouse must have a minimum of 10 hectares of urban area and have a reserve of land for growth of at least 10 hectares of useable land. 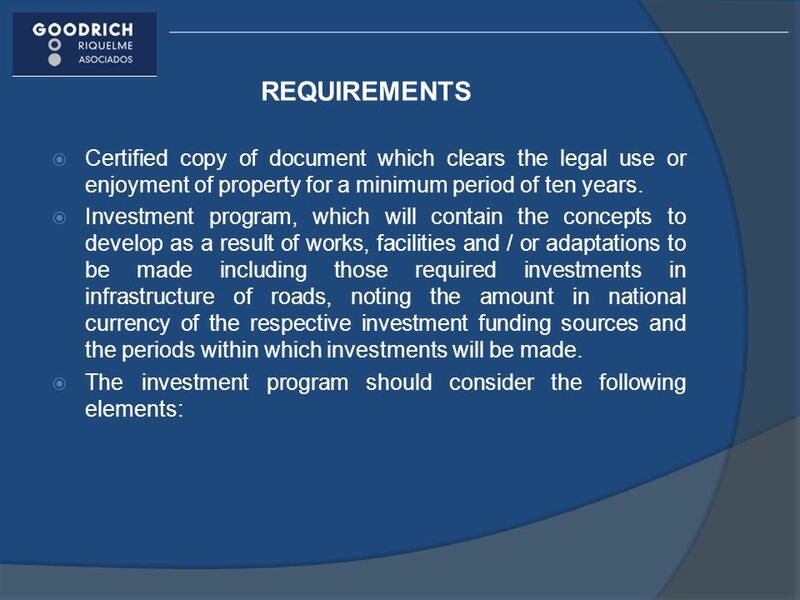 10 REQUIREMENTS Economic study that demonstrates the economic and financial viability of the project, which should be attach a written with approval by the National Bank of Public Works and Services SNC according to the guidelines set out in the website Certified copy of the documentation which was certifies the legal representative of the person signing the application, with power to administrative acts. 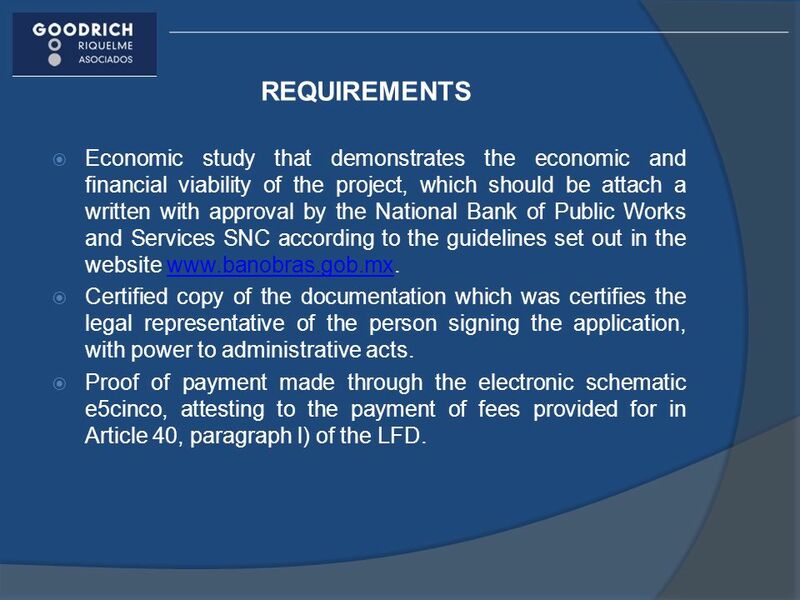 Proof of payment made through the electronic schematic e5cinco, attesting to the payment of fees provided for in Article 40, paragraph l) of the LFD. 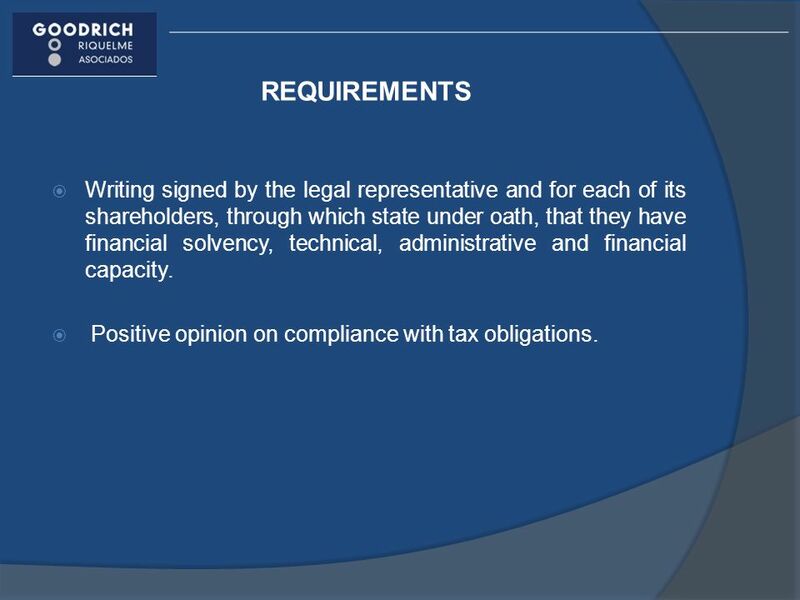 11 REQUIREMENTS Writing signed by the legal representative and for each of its shareholders, through which state under oath, that they have financial solvency, technical, administrative and financial capacity. Positive opinion on compliance with tax obligations. 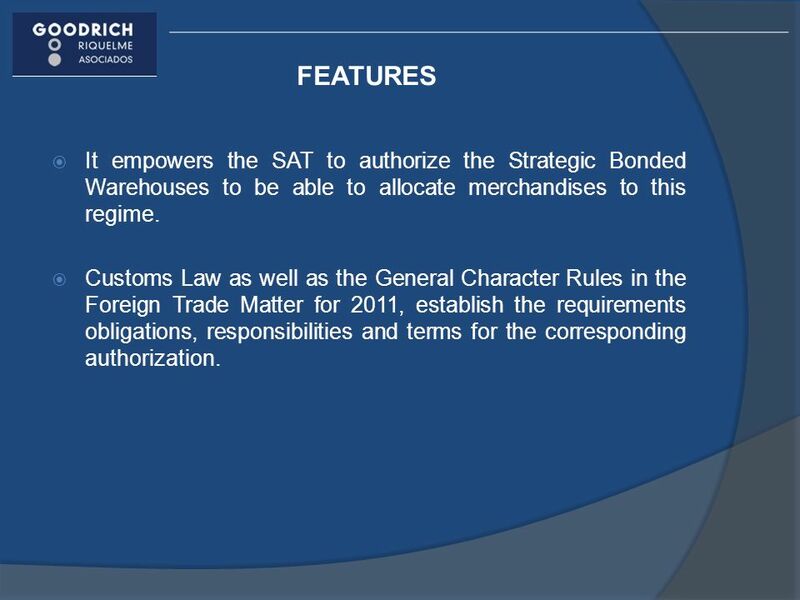 12 FEATURES It empowers the SAT to authorize the Strategic Bonded Warehouses to be able to allocate merchandises to this regime. 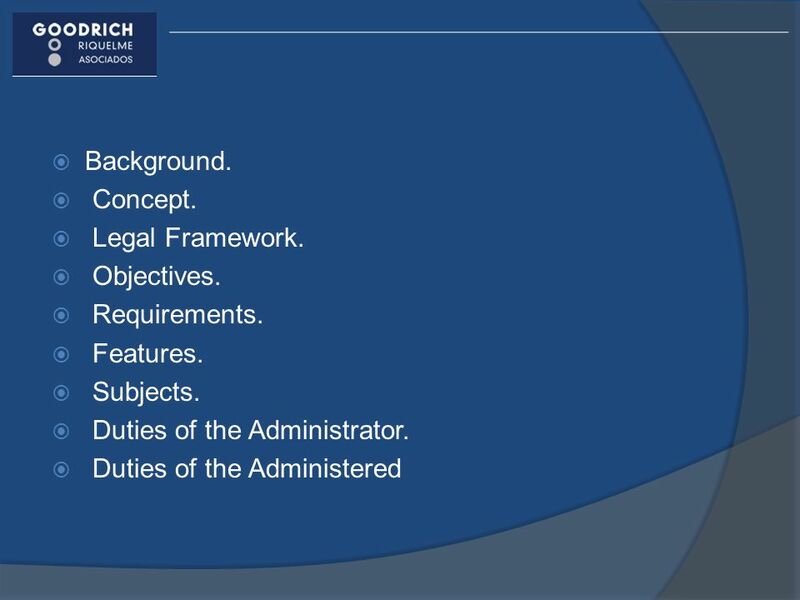 Customs Law as well as the General Character Rules in the Foreign Trade Matter for 2011, establish the requirements obligations, responsibilities and terms for the corresponding authorization. 13 FEATURES The goods could be designated to the regime by automatize registers (electronic notice) or the respective customs declaration. 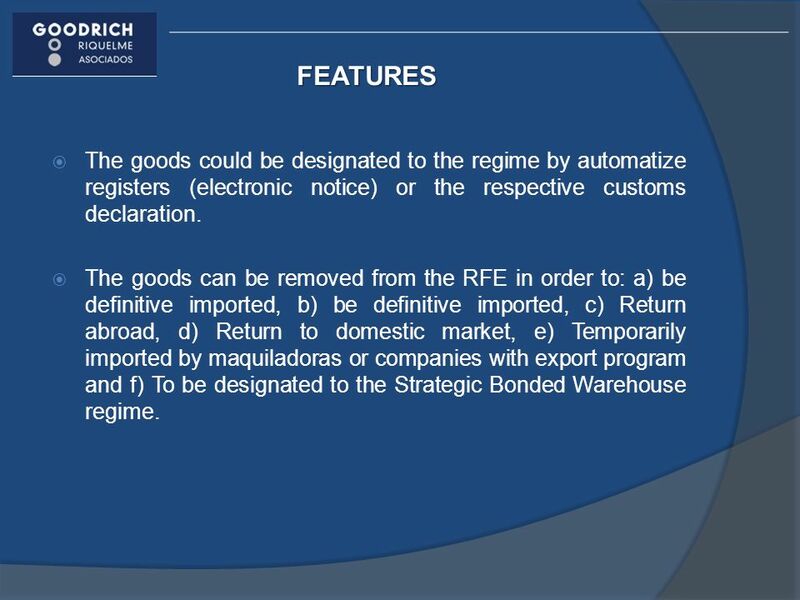 The goods can be removed from the RFE in order to: a) be definitive imported, b) be definitive imported, c) Return abroad, d) Return to domestic market, e) Temporarily imported by maquiladoras or companies with export program and f) To be designated to the Strategic Bonded Warehouse regime. 14 FEATURES Not subject to payment of foreign trade taxes or countervailing duties (deferral) even if there is causation, where article 63-A of the Customs Law, nor the fulfillment of the none taxable regulations and restrictions, and NOM'S, except animal and plant health, environment and national security. 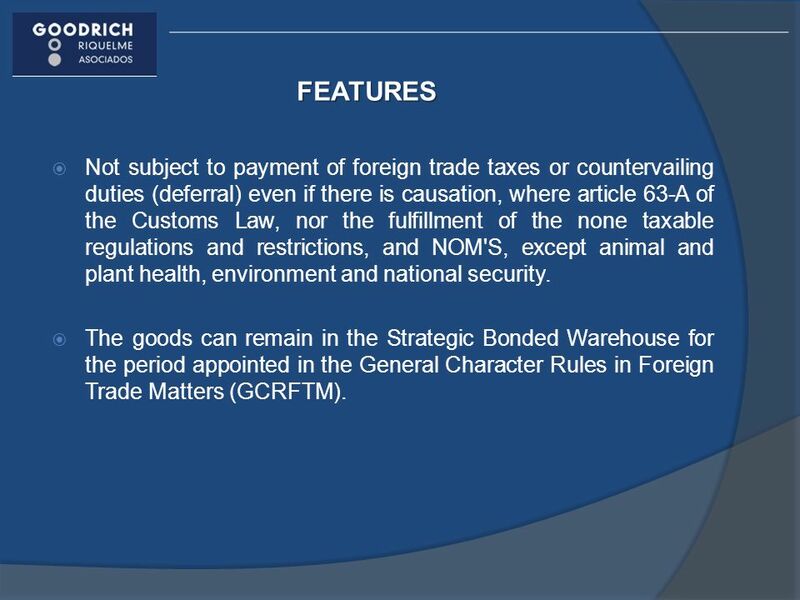 The goods can remain in the Strategic Bonded Warehouse for the period appointed in the General Character Rules in Foreign Trade Matters (GCRFTM). 15 FEATURES The remaining resulting from the processes of transformation, will not cause any contributions as well as the waste as long as this last one is proven to have been destroyed. The authorization can be granted till for a period of 20 years, which could be extended for an equal period of time. 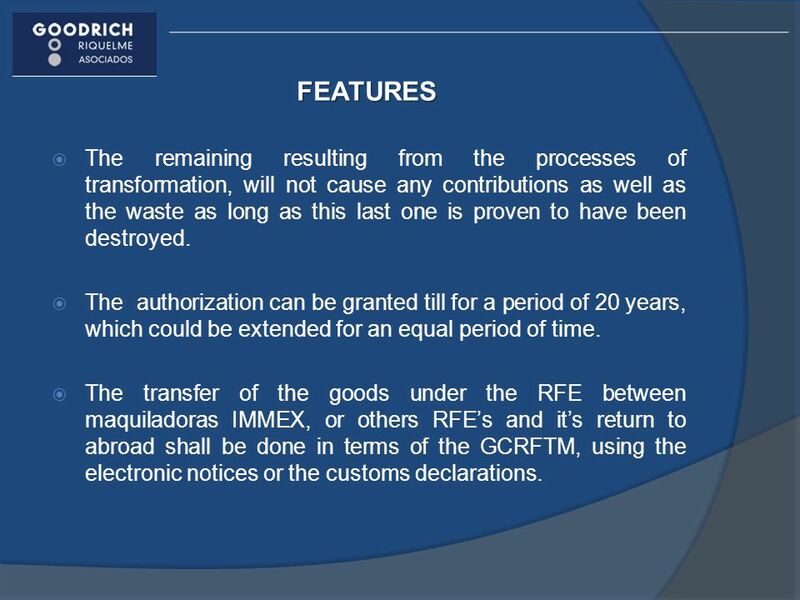 The transfer of the goods under the RFE between maquiladoras IMMEX, or others RFE’s and it’s return to abroad shall be done in terms of the GCRFTM, using the electronic notices or the customs declarations. 16 SUBJECTS Subjects that may be authorized: Administrator. Administered. 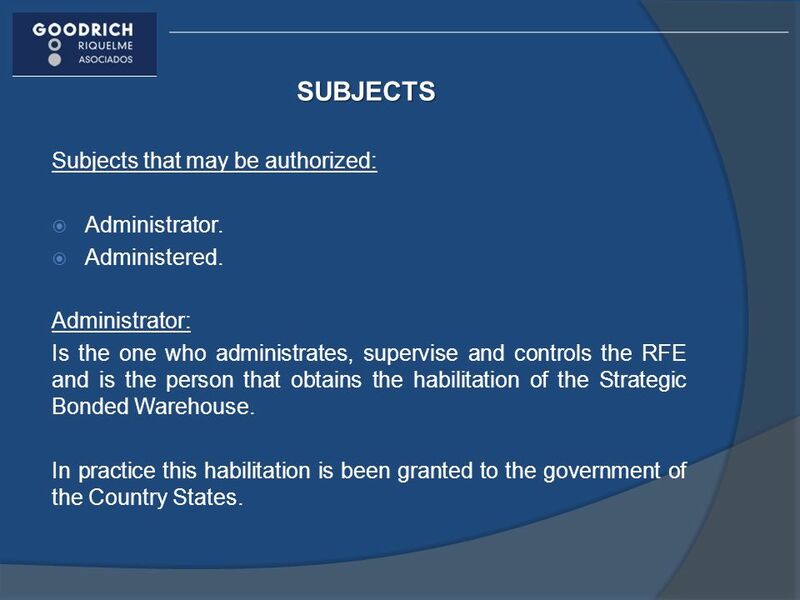 Is the one who administrates, supervise and controls the RFE and is the person that obtains the habilitation of the Strategic Bonded Warehouse. In practice this habilitation is been granted to the government of the Country States. 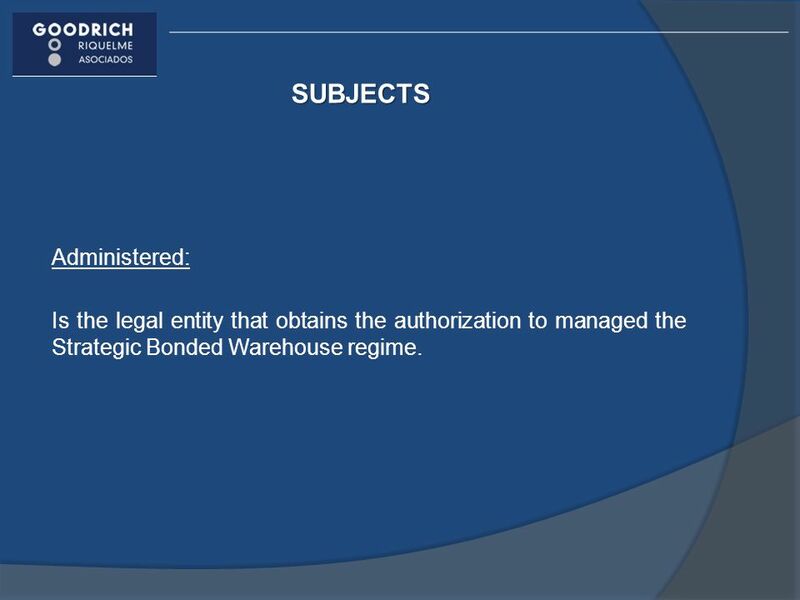 17 SUBJECTS Administered: Is the legal entity that obtains the authorization to managed the Strategic Bonded Warehouse regime. Take the necessary steps to delimit the enabled property. Install the X ray equipment’s, CCTV and other control means. Provide the necessary infrastructure for the submission of customs services that are required, as well as the maintenance and necessary services for the proper functioning of these facilities. Build, maintain and manage the common use infrastructure within the Warehouse and to ensure the provision of public services in these facilities. 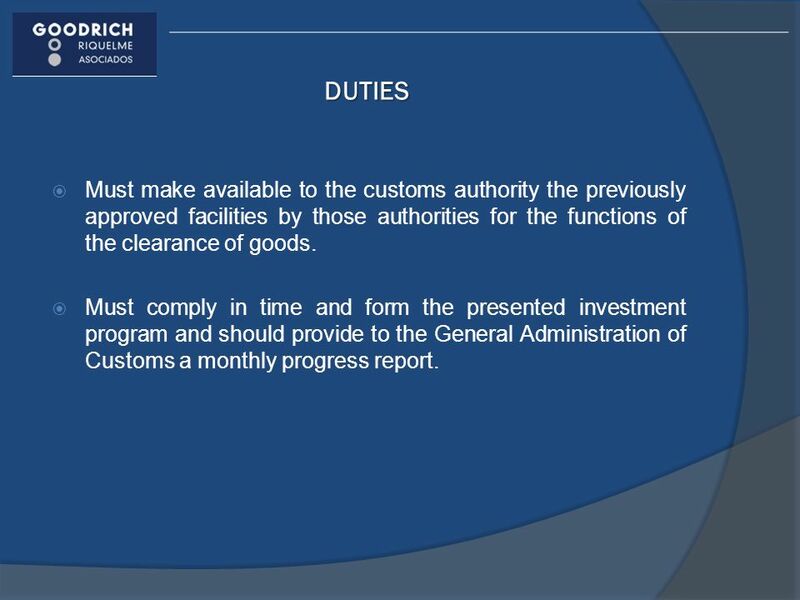 19 DUTIES Must make available to the customs authority the previously approved facilities by those authorities for the functions of the clearance of goods. Must comply in time and form the presented investment program and should provide to the General Administration of Customs a monthly progress report. 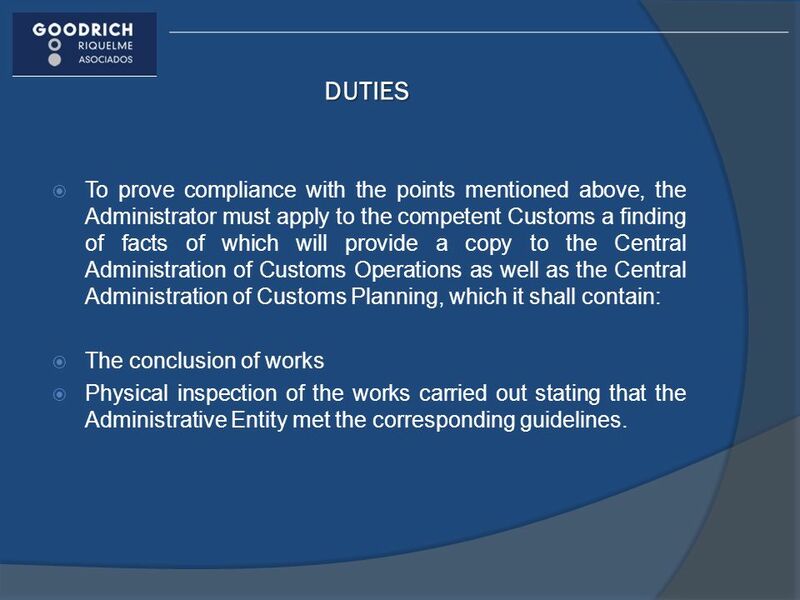 20 DUTIES To prove compliance with the points mentioned above, the Administrator must apply to the competent Customs a finding of facts of which will provide a copy to the Central Administration of Customs Operations as well as the Central Administration of Customs Planning, which it shall contain: The conclusion of works Physical inspection of the works carried out stating that the Administrative Entity met the corresponding guidelines. Register the documents of the goods entry and exit, such as customs declarations, cargo manifests, bills of lading, "Electronic Notice of Import and Export" and "Notices of transfer goods of IMMEX companies" and others indicate that if the case, in the applicable legal provisions. Provide, install and maintain the systems and equipment for the automated recording and control of entry and exit of goods. 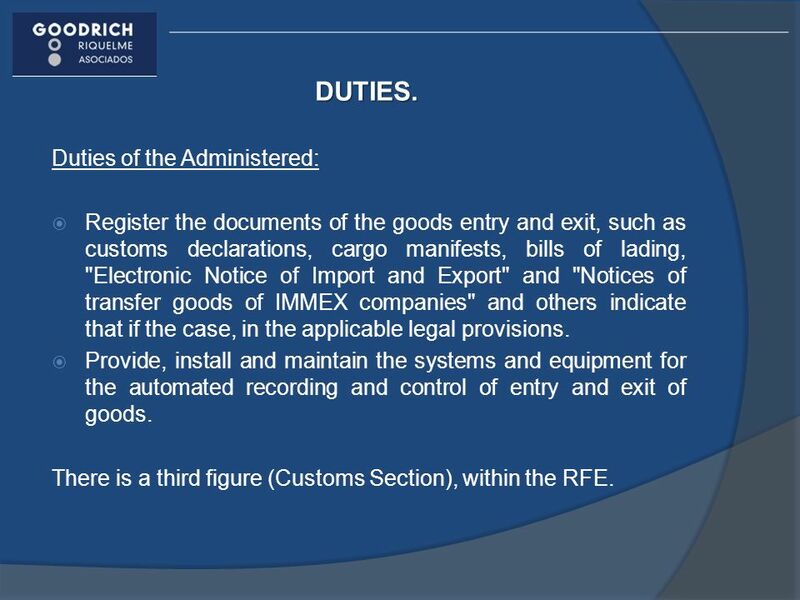 There is a third figure (Customs Section), within the RFE. 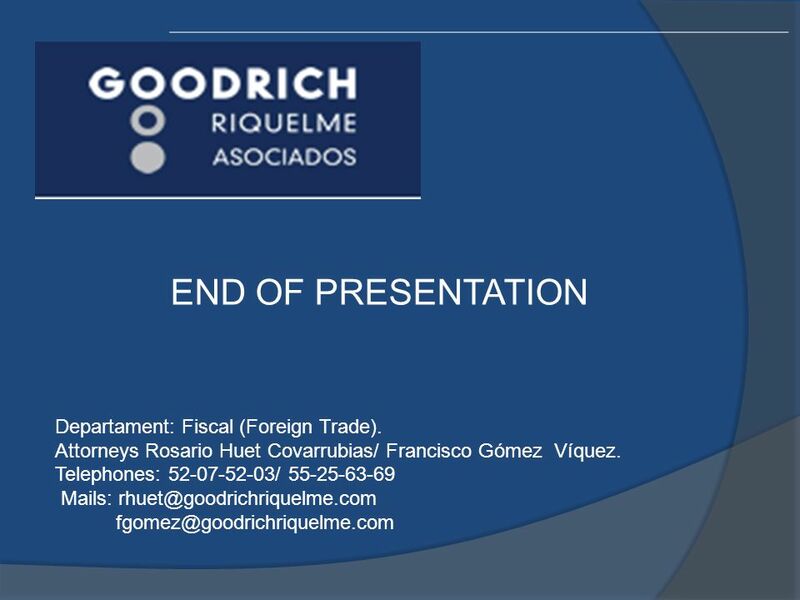 22 END OF PRESENTATION Departament: Fiscal (Foreign Trade). 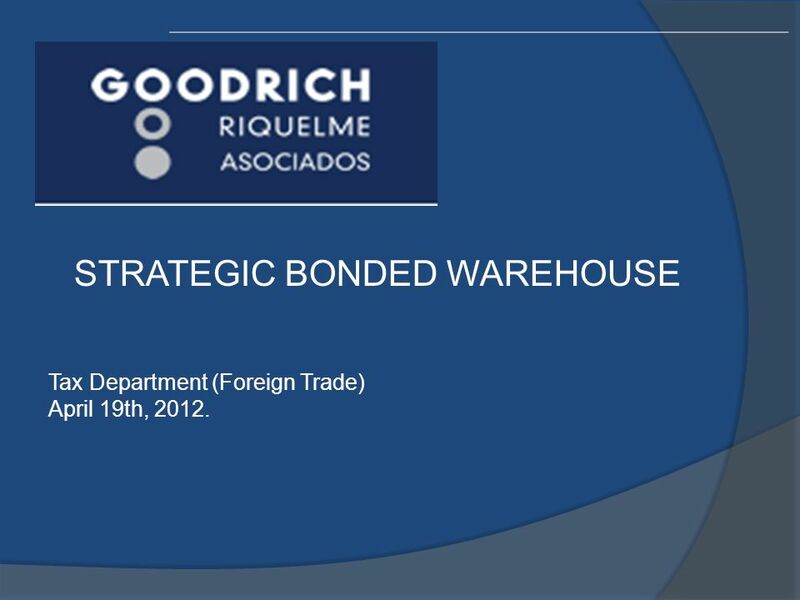 Download ppt "STRATEGIC BONDED WAREHOUSE"
FOREIGN TRADE GENERAL RULES 2011 WMTA Monthly Meeting August 2011. CERTIFIED COMPANIES Tax Department (Foreign Trade) April 10th, 2012. 2 Slovenia Signed Contract of Confidence for the period Compliance assessment for one programme for the new period Experience of a Certifying. 1 European Commission Taxation and Customs Union The Commissions FTT proposal COM(2011)594 of 28 September 2011 Manfred Bergmann Director, TAXUD-C Presentation. 2012 GEORGIA CONSERVATION PARTNERSHIP SUPERVISOR TRAINING Managing District Funds. Pension System Reform in the Republic of Macedonia Kiev, May 2004. AUDIT OF CO-OPERATIVE SOCIETIES 1SIMON RODRIGUES & ASSOCIATES. Fiscal representation Fiscal Rep B.V. specializes in developing VAT, customs and administrative solutions for companies who trade or want to trade in the.